The Strategic Response Mechanism (SRM) is a unique RRI program designed to enable timely, flexible responses to unforeseen opportunities and threats related to the recognition, protection, and realization of community land and forest rights. It complements RRI’s annual planning process (led by RRI Partners, Affiliated Networks, Collaborators, and Fellows) by allowing RRI to rapidly respond to time-sensitive windows of opportunity, as political environments shift, with funding of up to $100,000. Has outcomes dependent on incremental funding and connectivity at the right moment. RRI has effectively used the SRM to influence important legislation concerning tenure and resource rights, support partners’ engagement with national governments, and maximize private sector opportunities. Read about the success of recent SRMs, and explore the list of past and current projects below. The original intent of this SRM was for the Civil Society Oil Palm Working Group (CSO-OPWG) of Liberia to monitor the decision of the RSPO complaints panel against Golden Veroleum Liberia (GVL) for violating community rights. However, shortly after the SRM began, GVL suspended its RSPO membership and the objective of the plan was shifted to focus on monitoring GVL’s sustainability action plan instead. Although the CSO-OPWG was barred from the drafting of the GVL sustainability action plan and struggled to monitor it due to non-transparent implementation by the company, critical community awareness was raised on the matter. Under the leadership of Social Entrepreneurs for Sustainable Development, the CSO-OPWG informed communities and the government both of the complaints brought against GVL, as well as the RSPO decision against GVL. It also informed communities of GVL’s intended sustainability action plan. Furthermore, the CSO-OPWG held training sessions for complainant communities on effective monitoring techniques to use for both the RSPO decision and GVL’s sustainability action plan. The CSO-OPWG also published a full monitoring report on the sustainability action plan. In response to forced evictions of the Sengwer peoples and risk of eviction of Ogiek communities in Kenya, FPP used the SRM to substantially reduce the threat to these communities and securing the recognition of customary tenure through the implementation of Kenya’s recent legal developments and enforcing EU policies requiring human rights-based development cooperation. To do so FPP pursued domestic and regional (EACJ) judicial openings, obtained community title access for Sengwer and Ogiek communities, and advocated for the suspension of the EU WaTER project until it is restructured to protect the rights of implicated communities. Besides legal advocacy, FPP also utilized strategic dialogue, pursued a communications/media campaign, and mobilized communities for outreach. Though the Sengwer and Ogiek cases have advanced toward securing court rulings that protect communities from violence and secure their rights to customary lands, all have yet to be decided (decisions are imminent- 2019). Building on the adoption of the Bungoma County Forest Act, a strong alliance of forest dwellers and pastoralists was also formed (CLAN) to engage in community-county dialogues to support community tenure-based approaches to forest conservation including mapping customary lands, registering land claims, and applying for community land titles. In 2018, the government of the DRC announced its intentions to revise its Forest Code and threatened to lift the moratorium on forest concessions. Using the SRM, CFLEDD sought to create and implement a strategic advocacy and consensual action plan for use by civil society groups to secure their inclusion and participation in these processes. This was created with input from approximately 115 civil society members. CFLEDD also recruited three consultants to write technical notes on the Congolese Forest Policy, Forest Code revisions, the lifting of the forest moratorium, and the place of transversal themes and rights of local populations and civil society throughout these processes. These policy notes were then validated at national level workshops and formatted into brochures for wider public distribution. The information is formatted so that it is easier for communities to understand. CFLEDD also had exchanges with FONAREDD and the Congolese parliament to validate the technical notes. As a result of this activity and cooperation with administrative institutions, civil society and communities are much more strongly implicated in the advocacy process for the forest governance policies. This SRM addressed the serious threat posed by the Compensatory Afforestation Fund (CAF) Act of 2016 to the land and forest rights of tribals and other forest dwellers. The urgency comes from the fact that the rules for operationalizing the law are in process. The SRM sought to collect evidence on violations of the Forest Rights Act, land rights, and human rights by existing plantations and use this data to carry out advocacy to ensure that the CAF rules incorporate strong safeguards to protect the rights of tribals and forest dwellers including free, prior, and informed consent (FPIC). The mobilization and advocacy sought to ensure that CAF rules respect the powers and jurisdiction vested in Gram Sabhas (Village Assemblies) by the Forest Rights Act. Under the Forest Conservation Act of 1980 and Supreme Court instructions, any agency appropriating forest lands has to pay a substantial sum to compensate for the forest diversion at the Net Present Value of diverted forests. This amount is presently between Rs. 4 and 10 lakhs per hectare (US$5,500-$16,000/ha), depending on the quality of the “diverted” forest and is deposited in a Compensatory Afforestation Fund. Over a decade, the Compensatory Afforestation Fund has accumulated about Rs. 42,000 crores (US$7 Billion). The Supreme Court has allowed release of small amounts from the CAF for the last seven years but has insisted that the government of India enact a new law to unlock the whole fund. This proposal sought to support the CSOs and grassroots movements in their struggle to ensure that the CAF rules incorporate safeguards including FPIC; protection of rights and powers of Gram Sabhas and right holders vested under FRA; and control of Gram Sabhas over the Compensatory Afforestation Fund Management and Planning Authority (CAMPA) funds. The window of opportunity was small as the first version of the CAF rules was already drafted—however, timely advocacy by the CSOs with Members of Parliament and with media led to withdrawal of the rules. The SRM successfully held national-level consultations with forest rights groups and drafted a report on CAMPA and CAF rules and policies. RAKATA sought to develop and pilot a viable collaborative framework in four national parks pilot sites. These pilot sites will become the model for upscaling in the 74 national parks and protected areas in Indonesia. There are 33.6 million hectares of protected areas in Indonesia, with almost 5,000 villages located inside or close to them that lack legally recognized rights over their customary lands or forests. RAKATA seeks to work with Parks Authorities, CSOs, Indigenous Peoples and local communities inside parks and protected areas, and local entrepreneurs to create co-management systems through Integrated Site Planning Agreements (IPSAs). This SRM takes advantage of a small and critical window of opportunity recently opened with a champion of rights based approaches, and built on one of the major outcomes of the RRI supported October 2017 Tenure Conference held in Jakarta (hosted by the Ministry of Environment and Forestry, the Consortium for Agrarian Reform or KSP, and various CSOs). This opportunity to set an example for collective, community led co-management systems in protected areas is time bound and contingent on the favorable policy environment arising out of the Tenure Conference and the tenure of the current Director General. The objectives will be achieved through: helping the Ministry of Forestry Conservation Unit Directorate (KSDAE) establish model partnerships, co-management systems, and collaborative and collective management procedures; conducting an assessment of existing co-management systems in four priority sites and designing viable and up-scalable models for Integrated Site Planning Agreements (ISPA); conducting trainings, workshops, and e-commerce trainings collaboratively with KSDAE Units, Indigenous Peoples and local communities, local governments, and other groups signing up for Integrated Site Planning Agreements (ISPA); and strengthening/establishing active “Learning Centres” and “Knowledge Management of Culture, Forestry Conservation and Tourism Education Centres” for customary forests and village forests. As of 2017, Nepal is operating as a federal government and now that local governments are in place, the complex process of reworking laws, regulations, and governance institutions on the local level is getting started. This presents a unique window of opportunity to support local rights-based forest and natural resource governance and influence the future “status quo” of policymaking in Nepal. The biggest opportunity for impact emerges from the remarkable fact that almost 2,000 members of FECOFUN, Nepal’s national community forestry federation—this SRM’s proponent—have been elected into local governments, with many elected as mayors and deputy mayors. These, if organized, can become powerful instruments of changes in favor of community forestry, including for favorable laws and regulations. The SRM proposes to convene, train, and orient the local government representatives on the community forestry issues to ensure that the interests of community forest user groups (CFUGs) are protected and enhanced in the local government regulations and policies; and work closely with selected local governments to create model community forest laws to empower CFUGs, remove regulatory barriers, and initiate implementation of the model laws within their jurisdiction. The activity will build capacity of local government representatives (especially those who are members of FECOFUN) to protect and enhance the interest of CFUGs in local government laws and policies. By supporting the creation of a model or template “Community Forest Law,” the proposed activity will directly seek to ensure a favorable regulatory and policy regime for community forestry at local government levels. The National Land Law in Lao PDR (Laos) is currently undergoing revision, presenting a brief window of opportunity for Lao civil society and development partners to influence the revision process. The Land Information Working Group (LIWG) identified two periods for policy dialogue and advocacy: from February to June 2018 as the Land Law is being drafted, and from July to September 2018 when it will be under the scrutiny of the Lao National Assembly. The final law is due to be tabled in October 2018. Together with Village Focus International (VFI), members of the LIWG and the LIWG Secretariat are working to seize this political window of opportunity to engage in land-related policy dialogue and advocacy. The main aim of this proposed SRM is to form a Focal Group comprised of civil society organizations (CSOs) and development partners who have been working on responsible investment and community land rights in Laos, to develop a policy brief that can feed into the Land Law revision process. With support from the SRM, civil society is engaging in land-related policy dialogue and advocacy while the National Land Law is undergoing review. This will be achieved through mobilizing members of various government departments and organizations such as the Ministry for Planning and Investment, the Ministry for Natural Resources and Environment, the Mekong Region Land Group, and the German Corporation for International Cooperation (GIZ), as part of the Land Sub Sector Working Group (LSSWG); reviewing relevant literature, policies, legal and regulatory frameworks, and initiatives; and producing and disseminating a summary of Turning Land into Capital (TLIC) reports’ key findings. Through this SRM, the LIWG seeks to guarantee the National Assembly is well informed about this topic when deciding on the Land Law in late 2018. The Focal Group ultimately aims to incorporate provisions into the land law that ensure respect for community land rights and sustainable land-based investment. Innovation et Formation pour le Développement et la Paix (Innovation and Training for Development and Peace, or IFDP) which serves the Walungu, Kabare and South Kivu provinces in the Democratic Republic of Congo (DRC), created and advocated for a local legal framework to recognize and secure the land rights of local communities and Pygmy Indigenous Peoples in South Kivu province. This framework will be implemented at the provincial level; however, it is also a powerful tool that will support future reforms in other provinces and at the national level. 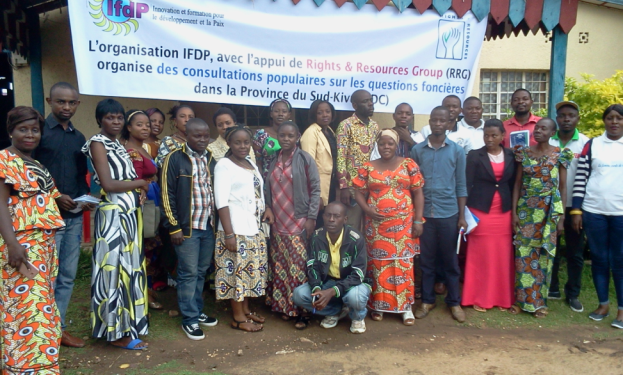 Entitled “Decree to support mechanisms to recognize and secure land rights for local communities and Pygmy Indigenous Peoples in South Kivu Province,” the legal framework was a collaborative effort involving CSOs, provincial government officials, and local communities. Following the drafting of the framework, the final version was approved by officials from the provincial land minister’s office as well as members of the land sector coordination committee in South Kivu. IFDP will continue to work with provincial government officials to pass the final version of the decree, and to implement the new law. 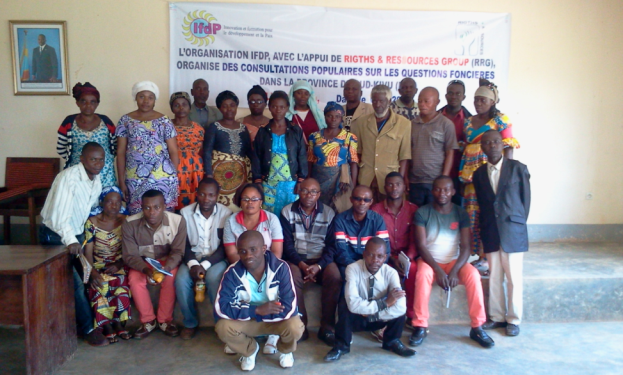 With grassroots support from communities who are actively seeking ways to secure their land, IFDP has ensured buy-in for local-level land reform during the national-level land reform process in the DRC, which is ongoing. 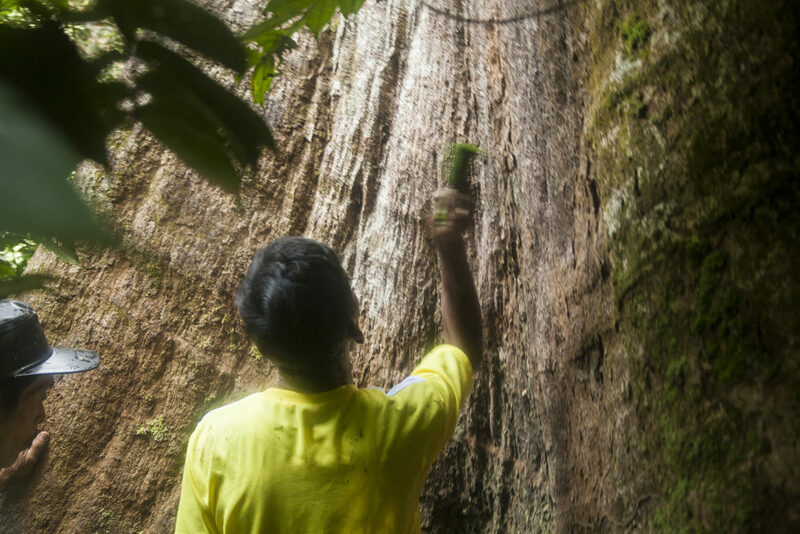 The SRM activity, approved in October 2017, strategically responds to an immediate and sustained threat to adat and local communities’ traditional lands and forest, and rich biodiversity posed by the expansion of palm oil in Riau Province on Sumatra within the Bukit Batabuh Forest Reserve. Riau Province is home to over 24 percent of Indonesia’s palm oil plantations, and is also the same area that is home to the Sumatran tiger which is currently listed as critically endangered. In Indonesia, during a period of 15 years (2000-2015) there has been an estimated 55 percent of forest loss from within concession areas, and an estimated total loss of more than 6.7 million hectares within and outside of concession areas. Indonesia has been losing its forests at a rapid rate for decades, and in turn, adat and local communities have been losing their livelihoods and their traditional lands and forests, as well as the wildlife and plant diversity that has been sustained by the primary forests. RRI support will provide the necessary resources to support the mapping of the management area with Bukit Betabuh in order to complete the main stage in obtaining the Social Forestry permit from the local administration, while simultaneously developing sustainable crop commodity plans for the jernang that will create an initial border around the community forest land. The proposed activity will help empower the communities with the Bukit Betabuh Forest Reserve and train the communities in the titling processes involved in Social Forest permits. These activities combined will not only create income-generating activities for the Air Buluh community, but it will allow them to have rights over their forestlands and help preserve the pristine tiger ecosystem. The SRM proposes to provide support to the Air Buluh community and the Bukit Betabuh Forest Reserve who have been the custodians of the lush forest – and home of the critically endangered tiger – for centuries, to enable them to have secure rights over their forests, to create sustainable forest enterprise by developing a community-led forest based enterprise model unique to a protected area and to set an example of community resistance to both Government and private sector encroachment on their land. This SRM was approved in August 2017. 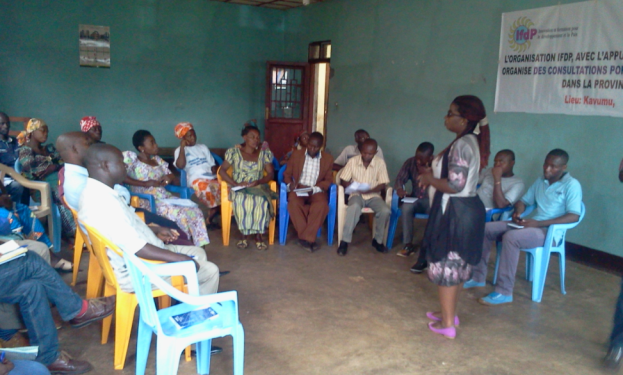 Its objective is to create a provincial legal framework to secure community land rights, especially the rights of women and Indigenous Peoples, which will reduce land-related conflict in South Kivu. This SRM was approved in late August 2017, and aims to ensure that a pro-community Land Rights Act (LRA) aligned with the letter and spirit of the Land Rights Policy is passed in Liberia. This SRM aims to facilitate the final adoption by the African Commission on Human and Peoples’ Rights (ACHPR) of a General Comment on land and property to the Maputo Protocol on Women’s Rights in 2017 by supporting a convening of key partners and Commissioners to finalize and agree upon the text. This SRM was approved in late June 2017. Its objective is to protect land and forest rights of Cambodia’s Kui Indigenous communities affected by 36,000 hectares of Economic Land Concessions (ELCs) granted to sugarcane plantation companies in Preah Vihear. An update on progress will be provided in December 2017. A description of this SRM is currently in the works. 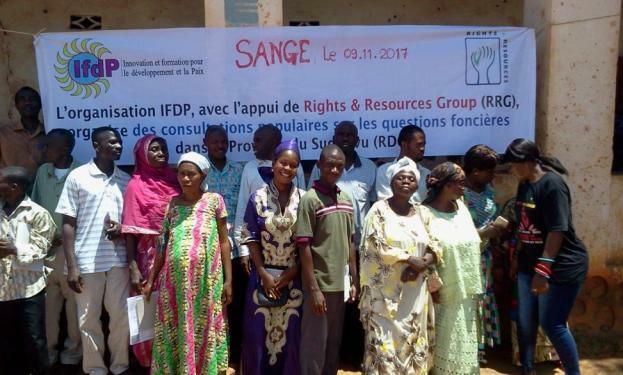 This SRM was approved in April 2017, and aims to support the socialization of Mali’s National Land Policy, ensuring both an improved participatory process for its development and improved content that better addresses the needs, expectations and vision of local communities in Mali’s five regions.